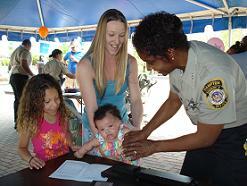 Picture right: Master Deputy Lynette Gittens fingerprints a toddler during the annual Child Identification festival. Sheriff B.J. Roberts and the Hampton Sheriff's Office made the spring of 2008 a special time to celebrate and show their appreciation for the Hampton community located in southeastern Virginia . Sheriff Roberts has put in place several community programs that support all factions of people, but he admits to having a soft spot in his heart for the people at each end of life's spectrum, children and senior citizens. As in any community, these two groups are the most dependent on others and by in large they are the most appreciative of assistance and we take great joy in celebrating them. Hampton 's Carousel Park was the site of the Sheriff's Annual Child Identification Festival in April and the four hour event drew hundreds of people on a day dedicated to children. Over 270 children were fingerprinted and nearly 100 free gun safety locks were distributed. The event was completely free and open to the public. The fully restored 1920 wooden carousel is one of only 170 working in the nation and it created an incredible backdrop for children of all ages to gather at the sunny outdoor event near Hampton 's harbour. More than 40 Hampton Sheriff deputies and staff members volunteered their Saturday afternoon to promote and encourage child safety to hundreds of children and their families. 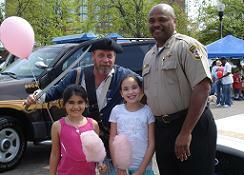 The festival's two large moon walks helped to work up an appetite as deputies manned stations providing popcorn, cotton candy and snow cones. Sponge Bob and Dora the Adventurer theme characters' teamed along side Pirates from Blackbeard's Crew parading the area creating smiles and laughter. Balloons and pop music filled the air as children participated in line dances and games. Sheriff Roberts feels that our rapidly increasing senior citizen population can never receive enough recognition for their contributions to the community and he constantly looks for avenues to acknowledge them. 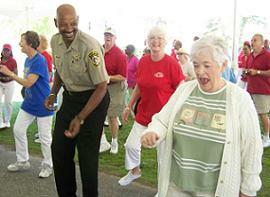 During May (Older Americans Month), the Hampton Sheriff's Office set out to make the annual Senior Citizens Picnic even bigger and better than the years before. Over 400 senior citizens converged on beautiful Mill Point Park in Downtown Hampton for an afternoon filled with food, music, dance and fellowship. The picnic has gotten so large that ticket requests for the May event start as early as February. The event was free and the Hampton Sheriff's Office provided a complimentary lunch of southern barbeque, hot dogs and baked beans to the large crowd of seniors. The volunteer efforts of dozens of Hampton Triad members , many whom are seniors themselves, were essential as they arrived early in the morning to setup, serve lunches and cleanup afterwards. Photo Left: Captain Kenneth Richardson holds off pirates at the festival. Photo Right: Sheriff B.J. Roberts joins the “Out of Line Dancers” as they entertain the senior crowd. 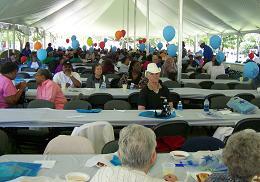 Photo Right: Hundreds of seniors listen to elected officials and community leaders while picnic lunches are served. The fellowship was fantastic and smiles and laughter were aplenty as seniors enjoyed hot food and cool lemonade while elected officials from Hampton and surrounding areas joined Sheriff Roberts in addressing the crowd. Each spoke about their offices' commitment to programs to assist senior citizens. Special guests joining Sheriff Roberts were Hampton Mayor Ross Kearney, Congressman John Miller, Delegate Mamye BaCote, Hampton Fire and Rescue Chief James Gray and Chief Charles Jordan of the Hampton Police Division. Nearly 60 members of the “Out of Line Dancers” from the Hampton Senior Center were on hand to entertain the crowd with music and dance. The level of energy displayed by the senior dance group, prompted picnic goers, Sheriff Roberts, Chief Gray and several other elected officials to join in for a nice after lunch workout At the picnic's end, 85 seniors were surprised recipients of the Emergency Safety Light, obtained with a state grant by the Hampton Triad . The blinking strobe light enables emergency teams to quickly locate persons in distress. Hampton Fire and Rescue showed their support of the event by sponsoring additional transportation to the park for dozens of senior citizens. 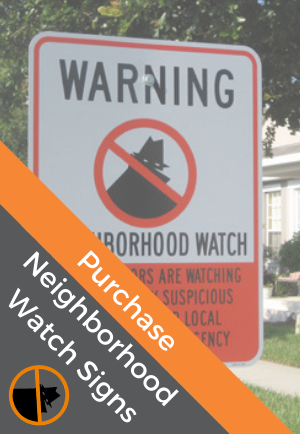 For additional information, contact: Lieutenant Alonzo Cherry at 757-926-2509.